Bi-directional couplers Two decades ago, RF/microwave system designers had to live with connectorized RF/microwave components (passive and active) from specialized component manufacturers, often ending up with a bulky and lossy system with lengthy interconnecting cables (flexible and semirigid). The interconnecting cables made the system unreliable over time. To compensate for the losses due to cables the system designers ended up over-specifying the discrete RF/microwave components, making them higher in cost.However, during the 1980s many system designers, especially in the radar field, started designing their own RF subsystems as integrated supercomponents using planar microstrip technology. This helped in miniaturizing RF/microwave subsystems and eliminated most of the interconnecting cables, thereby improving system performance. However, microstrip technology is limited in its usability as it is suitable only for narrow band applications due to dispersion effects and approximations in obtaining closed form design solutions. Furthermore, with the expansion of the microwave field from defense to commercial telecommunications, the system design has become more specialized, and over a period of time development of low cost surface-mount RF components has once again become a highly specialized area.More than a decade ago, Synergy Microwave Corp. introduced a series of surface mount RF/microwave components (mixers, power dividers, etc.) using microstrip technology; others later followed with microstrip and stripline surface-mount components. Though these low cost components have revolutionized the wireless technology leading to very small system products, they have not totally simplified the job for RF system designers in terms of efficient integration of these components into the system circuit board. The reasons are simple. The surface-mount stripline components essentially use a live via (typically a multi-layer via) for signal transfer from the stripline component to the system board. Since the system circuit board uses microstripline for signal flow between various RF components, the transition from the stripline component through live via pads to microstrip is abrupt and not well defined. 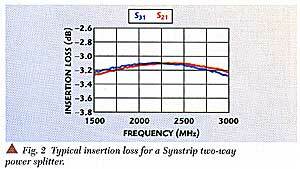 The discontinuity effects associated with this abrupt transition often lead to mismatch and signal loss.Therefore, system designers do not often see the true performance of the stripline components as claimed by the component manufacturer. Unless the system designer has the provision and ability to tune out the mismatch, he is bound to have integration problems. In addition, as stated earlier, the live via is a multilayer via for the RF signals and is more difficult to model and less reliable. To overcome this, a new technology for the design of multilayer surface-mount RF/microwave components including stripline components has been developed. The benefits of stripline/multilayer design are retained with this approach but a smooth transition from stripline to microstrip is now realized at the component level itself. The live vias are realized as single layer microstrip vias. This helps the system designer in effecting efficient RF signal transfer from the surface-mount component to 50 ohms. microstripline on the system board. The new technique (patent-pending) ensures minimum discontinuity between the 50 ohms line on the component board and 50 ohms microstripline on the system board. The benefits of both worlds are retained without compromising performance. The proposed technique is not restricted to surface-mount stripline components alone but is also applicable to any type of multi-layer RF/microwave component (both passive and active), ensuring only one type of signal transfer via, namely, the microstripline via, for the benefit of the system designer. Furthermore, remember that heating is greatest at the RF signal input ends where the power level is the greatest. 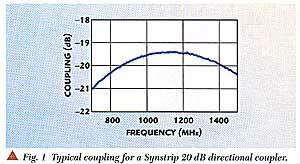 By virtue of design, a microstrip 50 ohms line can handle much higher RF power compared to similar 50 ohms stripline. For example, in the case of Rogers RO3010 0.025" thick material, a microstrip 50 ohms line can handle RF power in excess of 500 W without the temperature raising above 100° C, whereas a corresponding 50 ohms line on stripline can handle only up to 300 W of RF power with a temperature rise to 100°C. Therefore, it is advantageous to have a microstrip via for the surface-mount multilayer RF component rather than a multi-layer stripline via. • Efficient signal transfer with minimal mismatch. • Higher power handling capability compared to a stripline multilayer via. • Enhanced reliability due to a single layer via compared to a multilayer via.Using this technology, a new line of SYNSTRIP® couplers, hybrids and power splitters has been introduced covering the 650 MHz to 2.8 GHz frequency band for the wireless market. The new components guarantee higher power handling capability and enhanced reliability at a lower cost without compromising electrical performance. As stated previously, the proposed technology is not restricted to the described passive components but is extended to a new line of phase shifters, I/Q modulators, vector modulators, PIN attenuators and other types of passive and active discrete components and RF/microwave subsystems, as efficient surface-mount products. Typical coupling and insertion loss performance plots for a 20 dB directional coupler (800 to 1200 MHz) and a two-way power splitter (2000 to 2500 MHz), using the new technology, are shown in Figures 1 and 2, respectively. A new patent-pending technology has been developed and utilized to implement a new line of passive and active surface-mount components that provide efficient RF signal transfer to the system circuit board. 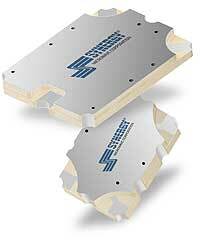 The SYNSTRIP®components result in high power handling capability and enhance reliability.